Loyal to none, Django soon finds himself caught in the middle of the violent dispute and, armed with a devastating weapon, he is forced to defend himself against both sides. But when a chance encounter with a former acquaintance presents him with an opportunity to make some money and settle an old score, Django decides to team up with his adversaries, risking everything in a deadly plot that could end his life. Originally banned in several countries (and denied a certificate by the BBFC in the UK until 1993), Djangoi still managed to make an international star of Franco Nero and, worldwide, spawned over 50 unauthorised sequels. One of the greatest Spaghetti Westerns ever made, and without a doubt the most influential, Sergio Corbucci’s iconic masterpiece is a landmark piece of cinema revered by film critics and Western genre fans alike. 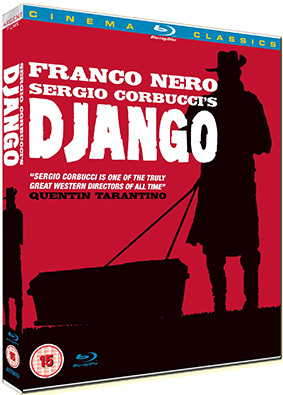 With Django the latest film to be reworked and regurgitated by a certain Mr. Quentin Tarantino, who described its director Sergio Corbucci as "one of the truly great Western directors of all time," its arrival on Blu-ray in its full uncut glory has been opportunistically time but is still very welcome. It will be released on 21st January 2012 by Argent Films at the RRP of £22.99.